It’s not just for St. Patty’s Day folks. This classic color, though traditionally popular, has also landed on the trend list for several seasons now. 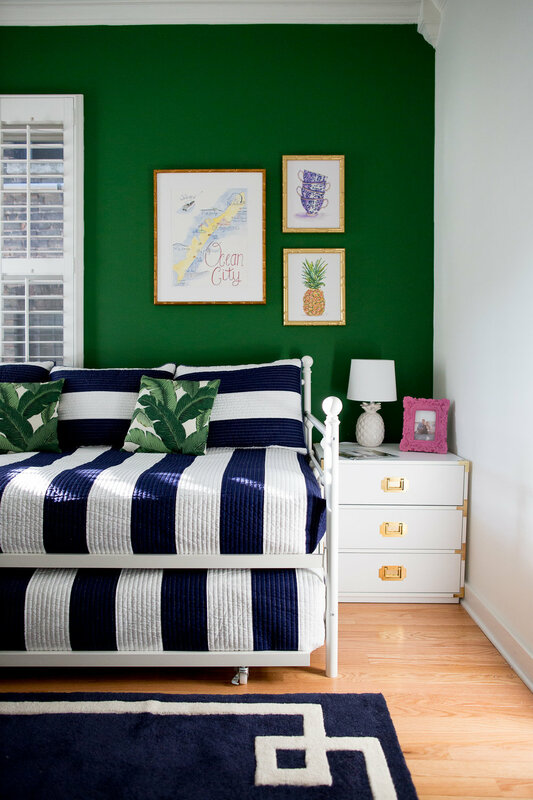 This bold and rich hue, clearly derived from nature (and the lush green Irish landscape), is a true middle green, without aligning to either the blue or yellow end of the spectrum. 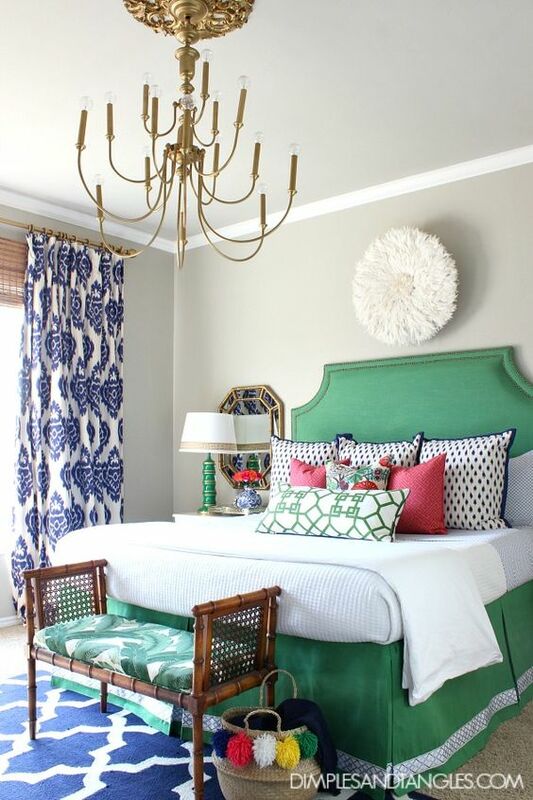 Here are some of my favorite colors to pair with kelly green, whether in small or bold doses. Which is your favorite color combo? I’m not a professional organizer…far from it! But organization and design really go hand-in-hand. January is the time for organizing resolutions right? I have been bingeing the Marie Kondo documentary on Netflix “Tidying Up” just like everyone else. And while the spaces are truly transformed through Marie’s (adorable) magic of tidying up, there’s really a next level to creating the home you’ve always wanted – the aesthetic. If you want your space to feel mature and cohesive, it’s worth investing time, and yes sometimes money, in also making it look the way you want it to. Here are 5 functional AND beautiful solutions to your organizational challenges, paired with the KonMari Method categories. Ok, so I’m counting bags in the clothing category since they are usually housed in the closet. If you have a beautiful bag collection, why not show it off? I LOVE this concept from Polished Habitat - it really elevates the clutches to art status. The only problem is that this was a DIY project, so if that’s not your thing (mine either), then search for something along these lines. 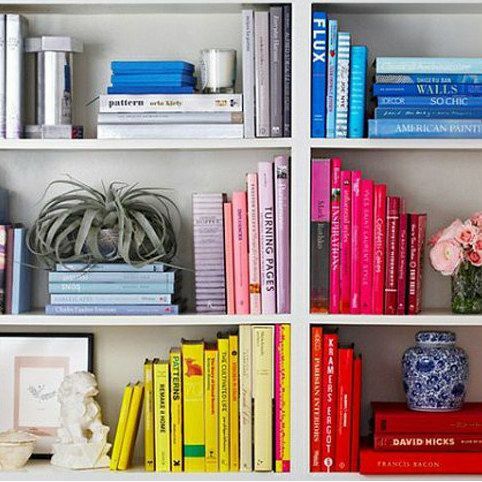 Color coding your books is all the rage and for good reason. It’s so visually appealing! There are so many ways to organize your books, by size, by genre, but this color arrangement is my favorite. The other key to this particular shelfie is that it incorporates objects and also switches up the vertical and horizontal stacks. That creates great balance and visual interest on top of the fun colors. This Buzzfeed article has other great organizing ideas. I’m not gonna lie, papers are the hardest for me. The incoming mail situation is basically unmanageable. Then there are all the documents you need to do something with now, later, maybe some day… it’s just hard. 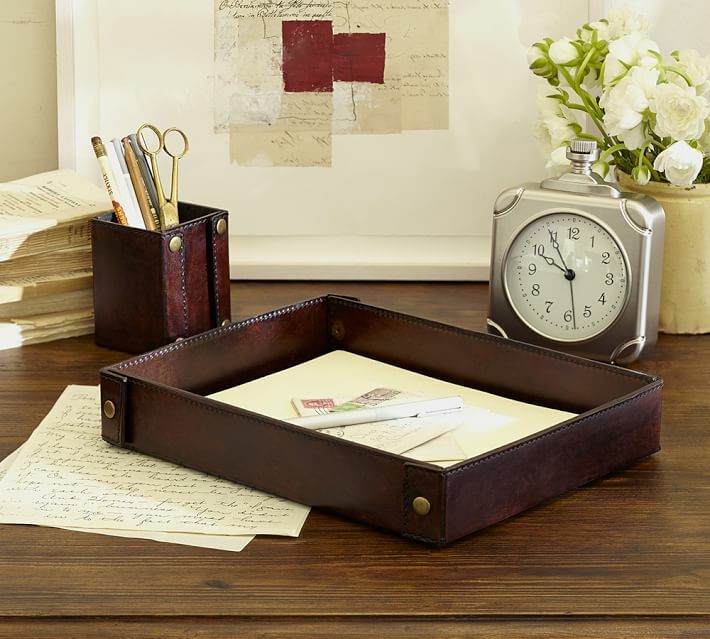 If you have something like this gorgeous leather letter holder from Pottery Barn, it’s at least a start. There is a surprising lack of pretty file storage out in the world right now. I have some pretty baskets from Target, but they don’t appear to make those anymore. Oh the magic of the tray. You’ve already seen it corral your papers. Here, the trays are grouping similar pantry items. Marie is a big proponent of using smaller containers within a drawer, shelf, etc. so she would love this too. The key here is that they are also pretty, not just a random cardboard box, and bonus, they also coordinate with the totally fabulous wallpaper. See more great tips on organization from One Kings Lane. Find fun trays in different sizes and colors from West Elm. Oh I’m sorry, did I say paper was my toughest category. Yeah, that was a lie. It’s definitely the sentimental items. But mostly because I can turn any item, including paper, into a sentimental item. I have friends who are the complete opposite and can ruthlessly discard any old thing, even if it is from their childhood, college, a gift… they straight up do not care. Not me - and apparently not just me because Marie Kondo leaves this doozy of a category for last for a reason. 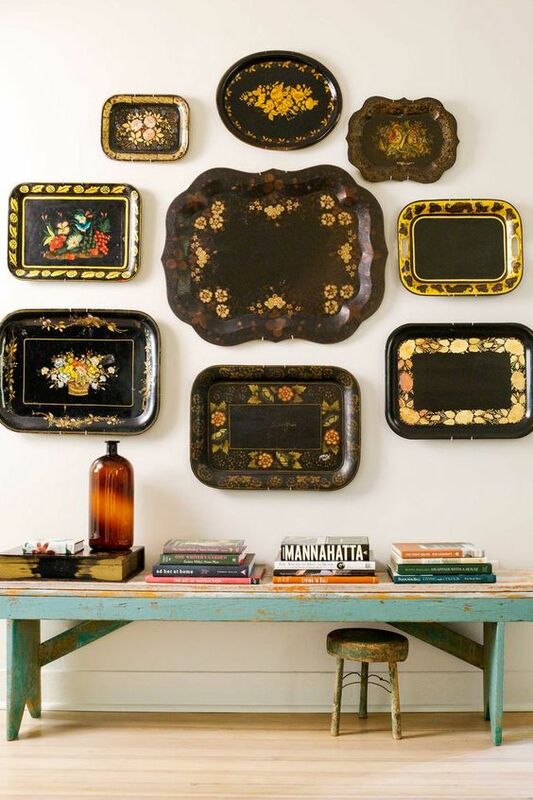 The best thing I can recommend is that if you do have a collection or heirloom that you do love, make sure you find a way to enjoy it and not store it away, like this great tray collection. This is great for the rarely used china and silver you know you have stored away. 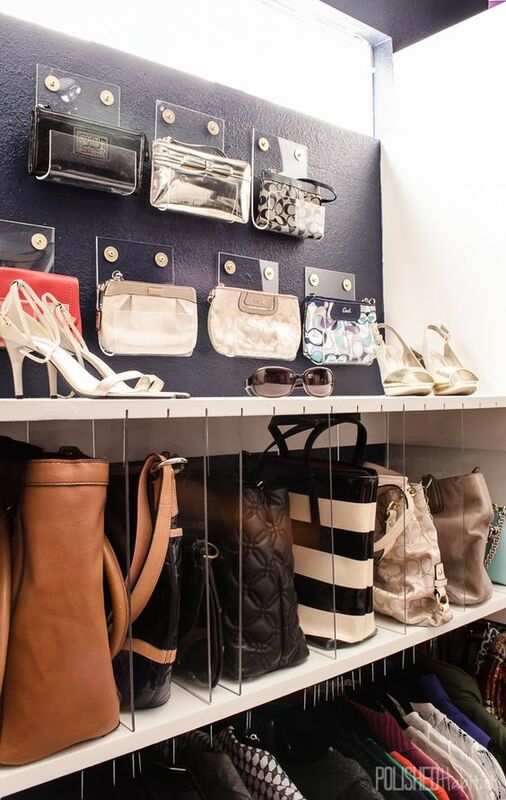 If you have other fun and pretty storage ideas, share them in the comments below! “Classy Man Cave” may seem like an oxymoron, but trust me it can be done. I recently had the pleasure of incorporating a man cave into a bachelor pad project and it was so much fun! Here are 5 ways to keep it classy. 1. Choose a sophisticated paint color. For this project we used Sherwin-Williams Homburg Gray. It is a beautiful, deep gray and perfect for creating a dark, cozy room. We were going for a British pub vibe, so dark walls were a must. Dark walls help to create that cave-like atmosphere…most men aren’t looking for a light and airy feel. You know I love navy walls, so that is another great option. 2. Have an awesome bar. Let’s face it, next to the tv, the bar is the most important feature in a man cave. Men like to get together and drink. Period. You want a bar with lots of storage for glasses, mixers, liquor, what have you. If you have the space, a kegerator or mini fridge is a nice addition. In this space, we opted for a traditional bar that the host can serve drinks from behind. There is even extra seating with bar stools. We kept it on pub-theme with the vintage carved pub mirror. 3. Comfortable seating does not have to be ugly. I’m afraid this is where a lot of man caves lose their sophistication. People focus only on the comfort and not on having a sofa or chair that is also aesthetically pleasing. Leather is a classic choice that also takes it up a notch. If you are planning to host lots of people, choose a large sofa or sectional - again, it does not have to be ugly. My client loves his leather swivel chair that can conveniently face the tv AND the bar and pub table. 4. Create a curated display of memorabilia. Yeah, this one is tough. Sports memorabilia is difficult to display and the colors can sometimes be non-classy. I recommend designating a specific area for these items and grouping them on a nice shelf. If you invest a little in specialty cases for things like baseballs, footballs, and autographed items, it will help it look more visually cohesive. We used an industrial shelving unit to display vintage books, heirloom bobbleheads, and other miscellaneous items (like classy “man candles” with scents like vanilla bourbon and smoked tobacco). 5. Hang cool artwork. Be discriminating here - you don’t have to hang everything up on the wall. And don’t just slap it up with a piece of tape. Group things together and unify them with similar frames. If you have a lot of smaller items, like beer signs, they’ll have more impact if hung tightly in a group rather than spread all over the room. Posters are fine, but again, it needs to be in a frame. This client picked out awesome movie posters, and we kept it classy by purchasing them all in the same size and style and with matching frames. I hope this helps you create your own classy man cave! I love cable knit. The chunkier, the better. It is super cozy, beautiful, and often hand knit. You can find it all over the place, but some of my favorite throws this season are at Restoration Hardware and Pottery Barn. Not a big surprise. Love this red one at Restoration Hardware. This gorgeous one from Etsy makes me want to curl up and take a nap right now. And finally, this is one of my all time favorite holiday/winter pins on Pinterest. Love the sweater, love the mittens, love the wreath, and even love the hair. Love. This year was my first time to attend High Point Market and it was an incredible experience! I feel so lucky to live just a short distance away from the largest furnishings industry trade show in the world. Since there are 180 buildings, 11.5 Million square feet of show space, and 75,000 attendees at each Market, I was a little intimidated heading into this adventure. So the first thing I did was seek advice FROM EVERYONE! My wonderful design professor, Loyd Dillon, said it’s like a reunion, conference, expo, and fashion show all rolled into one, and boy was he right! My design friends helped me pull together a list of vendors I should check out, and I studied the Market website like I was preparing for the SAT’s (yes, I go a little overboard sometimes). But I do have to say, having a plan is the only way you can take full advantage of such a massive show. Even so, I didn’t get to see and do everything I had hoped, but that just makes me even more excited for the spring Market! Here’s a summary of my first trip to Market and some things I learned along the way. 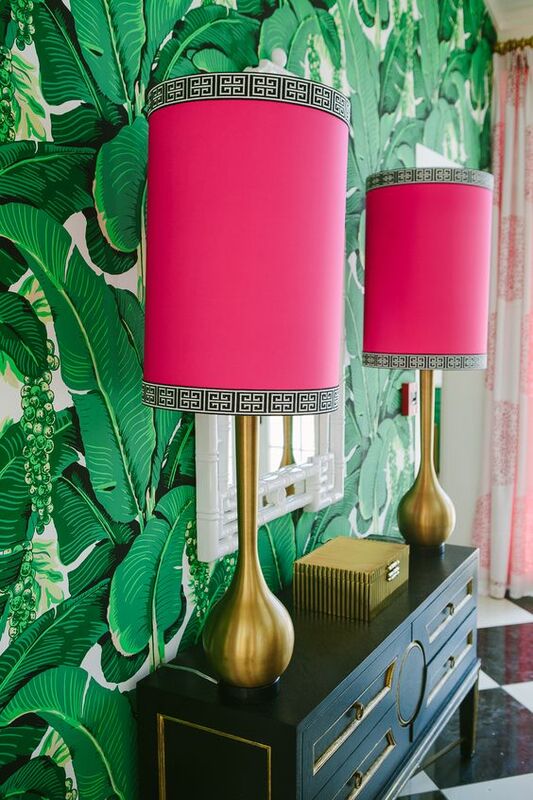 The Detroit Wallpaper Co. – They are so nice and cool and creative – loved meeting them! And their custom wallpaper designs are pretty awesome too. Mirth Studio – These custom wood floor tiles are ridiculous! Owner Sally Bennett and her team are also super cool. Can’t wait to use these in a project! Eloquence – Very European, Shabby Chic, elegant. Sarreid Ltd. – I called this “affordable Restoration Hardware.” They have a really cool customizable Italian line of cabinets called Rhapsody in Color. Visual Comfort – Out of control lighting – and some of it had super reasonable prices. jdouglas – Great variety of accessories – loved their wall of Lacefield pillows. Peninsula – Beautiful, European vibe. Bungalow 5 – Super stylish furnishings, I wanted to buy the whole store. Thibaut – Had heard of it, but hadn’t seen any of their fabrics in person before. Now, officially obsessed. I was pretty bummed my partner-in-crime, Cheryl Luckett couldn’t attend with me, but I was very proud of myself for going alone. And, being alone forced me to work on my networking goals. JLV Creative – Jesse is my new bff – I saw her about 25 times at all the same events as me until finally I introduced myself. She is an awesome designer and beautiful person and we had so much fun together on the last day. Stacy Morgan – Very cool Raleigh girl – we totally hit it off and she was so nice and shared all kinds of good designer info with me. Dunes & Duchess – Michael and Stacy are so incredible and nice. We had a little photo shoot in the booth which made me feel very VIP. Antiques Diva (Toma Clark Haines) – Toma has THE BEST JOB IN THE WORLD! She hosts European antique buying tours. Sign me up! The Decorating Diva (Carmen Natschke) – This girl knows her social media! Parker Kennedy Living – Was so excited to finally meet Lance and David. Love their style. Little Green Notebook – Jenny is a BIG DEAL. She writes for Domino, has a very popular design blog, and is sooooooo down to earth. Jesse and I felt really cool that we got to tell her about Mirth Studio. As a lifelong learner (aka school nerd), one of my favorite parts of Market was the educational classes. I picked up some valuable tips that will help me with my business, and also got to meet some important people in the design world. iChannel: Building an Influential and Powerful Communications and Marketing Platform via Social Media with The Decorating Diva (Carmen Natschke) – this is one of my weak links, trying to beef up my social media presence. Antiques Diva Style Guide & Champagne Brunch – I can’t imagine a more perfect combo than antiques and champagne! We learned all about major French furniture antique periods. Getting Published in Print and Beyond – This was a great panel with Tobi Fairley, Antonia van der Meer, Editor-in-Chief of Coastal Living, and Jessica Thuston, Executive Editor of Southern Living. Untangling the Web: How Blogs and Social Media are Transforming Design. This was a star-studded panel featuring Mark D. Sikes, Paloma Contreras (La Dolce Vita), Jenny Komenda (Little Green Notebook), and Suzanne & Lauren McGrath (McGrath II), moderated by the hilarious Robert Leleux, Domino Magazine’s Editor-in-Chief. Wow. Again, feel lucky that I’m even in the same room as these incredible designers. Have a plan – Super critical, if you have things you need to accomplish. Wear comfortable shoes – the only downfall to the fashion show at Market is that if you aren’t wearing comfortable shoes, you will die, and there just aren’t enough super cute, super comfy shoes out there. Pick up the (10 lb) directory at the END of the day – I was so eager to start collecting all my materials that I grabbed the giant directory of all vendors and info right off the bat. At the end of the day, I thought I might need shoulder surgery. There are plenty available, get it at the end. Print out your itinerary – as cool as the Market App is, mine malfunctioned halfway through Market and I was very glad I had brought an old school back up paper list of my vendors and events to attend. All in all, it was one of the most profound experiences I have had as a designer. I keep referring to it as “design heaven” because it is a convergence of all beautiful design things and all beautiful design people (from all over the world) and there is nothing else like it. I feel extremely special that I am able to attend and I already can’t wait for the spring Market! I love how lighting can transform a room. In a recent client project I had the chance to update the lighting in almost every room. The couple had a very Old World, European, yet classic, style, so we found a great fit with the Progress Lighting Fiorentino collection. It has beautiful seeded glass, which casts the light in a really unique way on the ceiling. Since it was all part of the same collection it brought a cohesive feel throughout the rooms, and yet each space got a different fixture. Isn't the light just gorgeous on the ceiling? Which fixture is your favorite? Today is my birthday! I tend to treat birthdays like a mini New Years – I like to reflect on the past year and review my accomplishments and also look toward the coming year with new personal goals. Over the past year I’ve had a lot of changes. I started a new (day) job that I love and with people with whom I love working. I started taking design classes again after having taken a year off. But I am most proud of having started my own business, and all that entails, and what a huge step that is toward creating the life I want to lead and becoming the person I want to be. I did not do this alone…I have incredible support from my friends and family. Over the next year, I have the obvious goals of growing my business, learning and experiencing more with design, and helping people create the beautiful homes of their dreams. But I would also like to “embrace the imperfect” – the advice given to me by Myquillyn Smith (“The Nester”) whom I recently had the pleasure of meeting in person. Her book The Nesting Place: It Doesn’t Have to be Perfect to be Beautiful is a game changer for me. I’m certainly not perfect, but I spend a little too much energy trying to always have everything perfect and this year I’m going to let that go. This means more entertaining, even if my house isn’t exactly how I want it to look. And using things instead of saving them. And putting nails in the walls (which I am terrified of because I have plaster walls and it’s kind of a disaster). I have a feeling it’s going to be a wonderful year. I can't tell you how incredibly exciting it is for me to be sharing this website with you! I have been dreaming about Artful Interiors for many years now and it's finally all coming together. I have always loved everything design related. Even back in high school, long before I had a home of my own, I would pore over Pottery Barn catalogs and Shabby Chic books and dream about my beautiful future home. After an undergraduate degree in Biology and a masters in Arts Administration, I have found myself, yet again, in school earning my design degree. I wouldn't change anything about my winding path and truly believe that it has all led me to exactly where I am right now. Starting a business is thrilling, challenging, and daunting, but I can't wait to see where it takes me and I look forward to sharing it with you along the way!